Wedge wire screen pipes are composed of simultaneously winding a spiral of profiled working wire and welding them to support wires, which are arranged along the axis of the cylindrical construction. 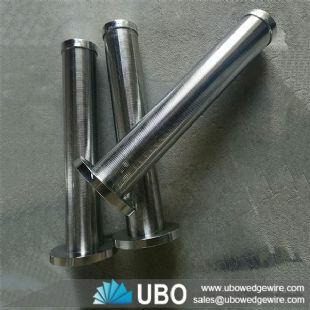 UBO wedge wire wrapped screen pipe (external profile wire and axial internal support rods) is a kind of strainers that flow from outside to inside filtration. Also, flow from inside to outside filtration is available by changing the support and profile wire position. Various wire and support rod sizes can be used to produce screen designs for your particular application. 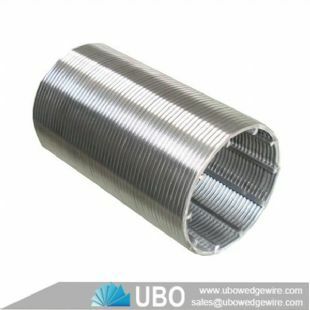 Wedge wire screen pipe, once manufactured, can be reverse rolled to any desired sieve radius, or flat rolled, to suit many different applications. Surround frames, or stiffener bars, can be added to suit your needs. Wedge wire screen pipe, once manufactured, can be reverse rolled to any desired sieve radius, or flat rolled, to suit many different applications. Surround frames, or stiffener bars, can be added to suit your needs. 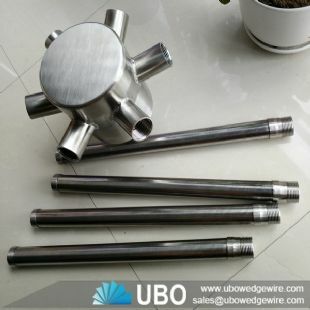 UBO can offer wedge wire wrapped screen pipe in normal specifications with the slot size from 0.2 mm to 5 mm, while pipe diameter from 25 mm to 2500 mm. The maximum pipe length is up to 12 m with customized material.